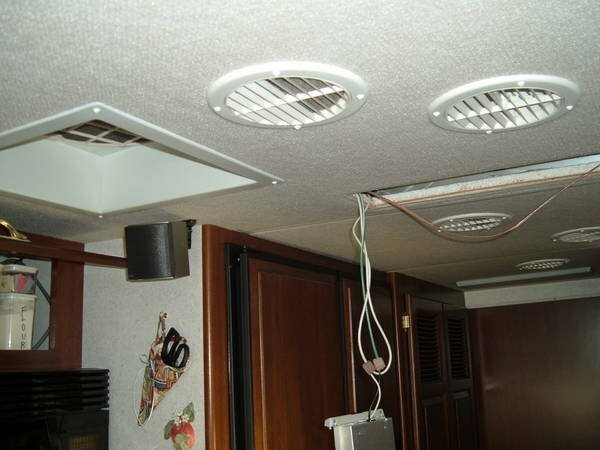 I have installed a new TV and need to run another set of RCA cables over to the sound system cabinet located on the passenger side behind the passenger seat. The TV is located in the center in the front. Any suggestion where and how to run another cable? I can't find a way to remove the wood trim over the entry door and behind the control panel up front. Not sure you still need answer Don but will give my advice, hate to see questions unanswered. 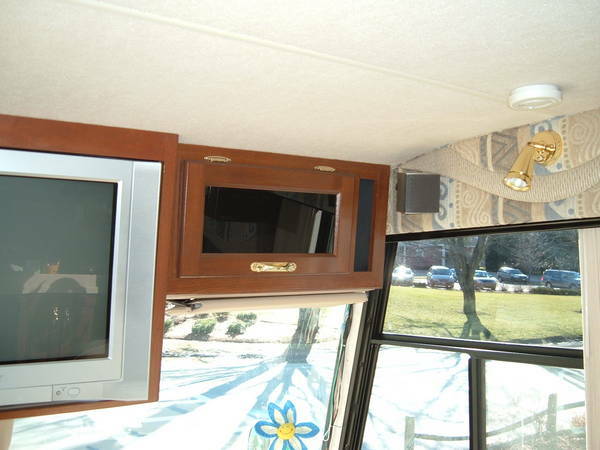 Looking at your coach brochure your amp,DVD, receiver cabinet has a channel off left side, over door entrance, to front "A" channel location to front cabinets over windshield area. The channel also has your curtain within it also. The new RCA connector cables can run through the overhead above curtains as I did when I ran wires for new surround DVD system for rear speakers in my kitchen area. You will need to use a drill large enough to get RCA plugs through hole for a wire and plug getting wires through. The ceiling will be blocked running wiring front to back but can be fished from sided wall to sidewall. If you have TV out you may see the exsisting wiring maybe running through channel in ceiling to amp cabinet from TV location. If you look in Quick Tips link you will see these pictures and others to maybe give you some ideas. Thanks for the information...still trying to figure out how to remove the wood trim over the door. This is where the curtain and sun shade attaches. If I can get this done then I can run the wire behind it. Don must trim I have had on my three Newmars have been stapled to the trim boards. Use a heavy wide bladed spatula and gently lift the bottom of trim, the staples are heavy type you maybe able to get bottom of trim out enough to tuck wires up behind trim. The long staple could be bent back behind board when repositioning it back or a good adhesive to hold in place.